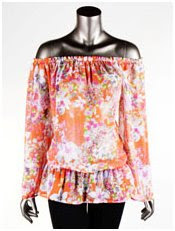 New from LDesigns: Beautiful Printed Orange Chiffon Top. Wear on or off the shoulder for a more trendy look. Be the first to be wearing new spring fashions. http://www.shopldesigns.com/.